I never realised how dull stairs could be…these stair designs are amazing! Just a little bit of wallpaper and a keen eye for a good pattern is necessary for these ones – so simple but it creates such a striking and fun effect. You could also use paint and stencils if you have more time (and energy). 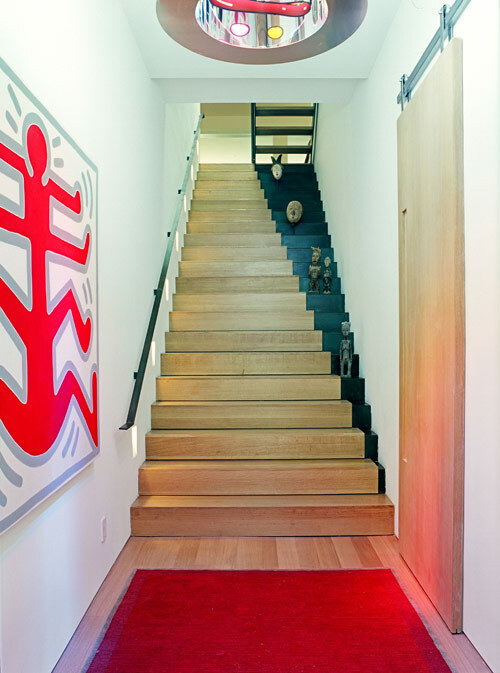 Dark paint and masking tape create a brilliant illusion on a staircase. Good for fairly wide steps, and if you want to display your precious things in a clearly marked out area! 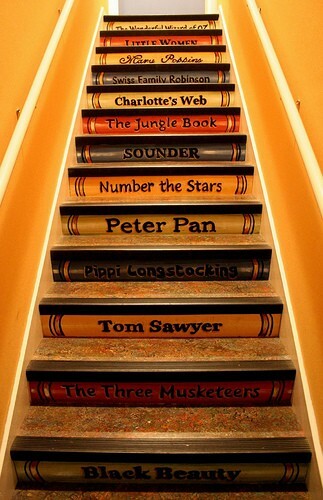 If you had a few stairs that led up to your child’s room, this is a lovely idea to paint their favourite books onto each step. Probably not for your main stairs – but how great is it to encourage a love of books every time they went up to bed. Would you be up for doing something like this to your stairs? Any of these ideas appeal to you? We don’t have stairs in our flat, and now I’m sad.